Thank you for your interest in and support for the READS-TO-GO KitKeeper service. We are now engaging in the second phase of our KitKeeper site configuration process and we need your assistance. Please visit our KitKeeper site and log in. 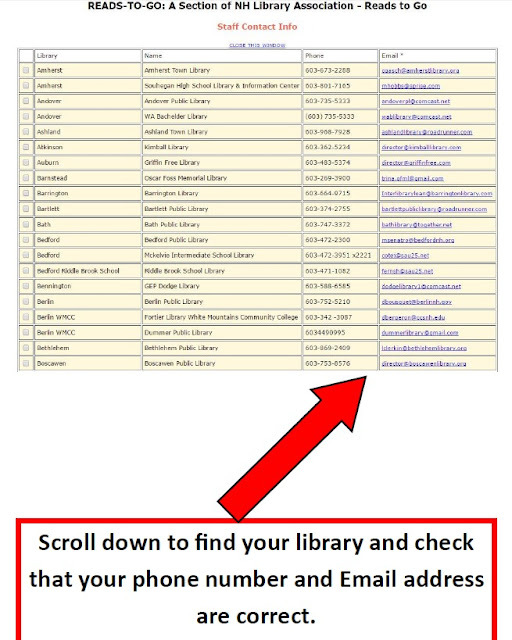 Obtain your library's username and password through the announcement on the NHAIS-List or by contacting the kitkeeper team at nhkitkeeper@gmail.com or if you have any difficulty logging into the site. 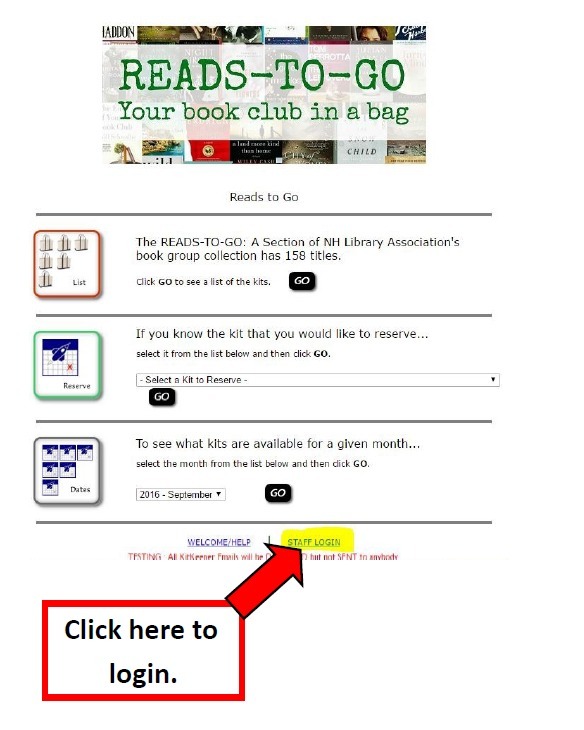 Once you are logged in, check to make sure that your library’s staff contact information for the person that manages your READS-TO-GO kits is accurate. Specifically the phone number and Email address. The screenshots below will show you how to check this information. If any changes need to be made please Email us at nhkitkeeper@gmail.com or call us at 485-6092. 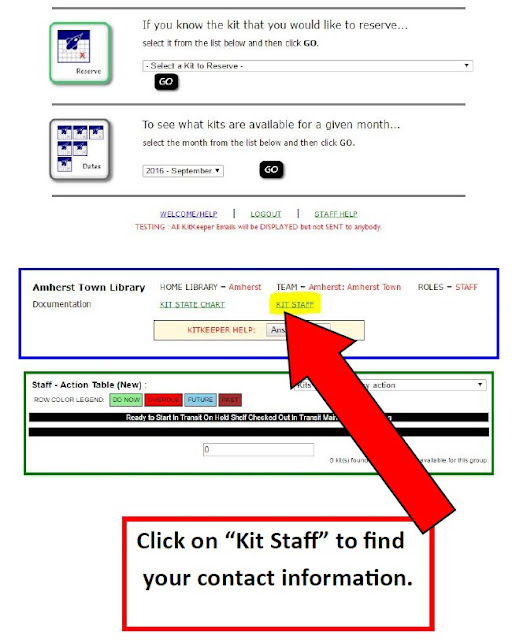 If your library lends any kits we require additional information. Please send us your reservation schedules as of November 1 so that we can add the reservations to our KitKeeper site. If we encounter any scheduling issues due to the 8 week lending period in KitKeeper we will contact you to resolve them. You can send your schedules via Email in any format that is convenient for you. Our goal is to launch the site by November 1, 2016, so please help us by complying with our request by Friday, October 21. With your help we can remain on target to launch the service this fall! If you missed our initial announcement on the NHAIS List in early September, you can read it the post dated September 2. Thank you once again for your support and enthusiasm and please contact us at nhkitkeeper@gmail.comwith any questions or additional feedback. 1. Where can I find step-by-step documentation for how to use the service? 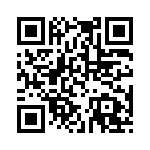 Please visit our online user guide for step-by-step instructions. You can also watch this brief video about the service to learn more about it. 2. Will the service be accessible to patrons? No, the borrowing library is the 'patron'. Our service is currently designed for librarian use only. Patrons will still need to speak to librarians to reserve kits through their library. 3. Is the Kit lending period adjustable? No, the length of time for the lending of kits will be 8 weeks once our KitKeeper site goes live. 4. 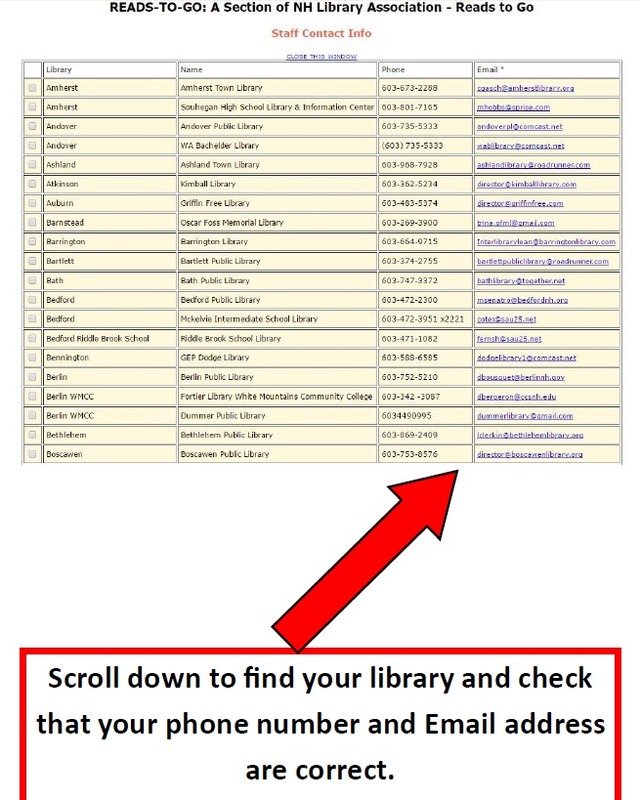 Can I update my own library's contact information and kits? No, you must contact us at nhkitkeeper@gmail.com and tell us the information that needs to be corrected. 5. Are kit barcodes and patron barcodes required? No, kit barcodes can be used by libraries but are not required. Patron barcodes will not be used since the service is for librarians only. 6. What if my library picks-up van delivery at a different library? If your library receives van delivery at a different library, there will be an option available during the reservation process to select your associated pick-up library. 7. How will I be notified when I need to send off one of my kits? KitKeeper will send your library an email to tell you which kits you need to get ready, which ones are due soon, and which ones are overdue.